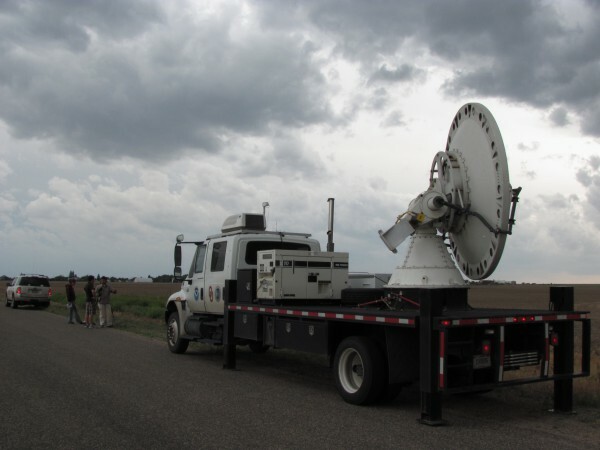 A “Doppler on Wheels” radar dish scans an incoming storm system in eastern Colorado as part of the 2010 VORTEX 2 expediton. That’s why Wakimoto and a team of experts from around the country organized VORTEX2, one of the largest field studies of tornado weather ever attempted. With more than 140 scientists and 35 research vehicles, it’s a mobile armada, equipped with doppler radar trucks, car-mounted weather stations, and dozens of deployable instruments that can be placed in a twister’s path. Dowell manned the nerve center of the entire operation, a white ambulence-like truck with three computer stations inside. Once his team identified a promising storm, he helped coordinate all 50 vehicles as they jumped into action, drove to an area in its path, and surrounded it with weather instruments. If they were lucky, the storm cranked out a tornado–if not, they were left with just wind and rain. By the end of their expedition in mid-June, the VORTEX2 team had driven more than 16,000 miles, and was able to measure only a handful of tornadoes in all. But Roger Wakimoto says that this still left them with a wealth of information. Although sorting through the data might take years, he thinks it could help shed light on the forces behind tornado formation, and lead to more accurate tornado warnings in the future. You can see photos from the three days I spent on the road with the VORTEX2 team in the slideshow below, or learn more about tornado science on NOVA’s “Hunt for the Supertwister” website.